With wild temperature swings, sea turtle rescue season shows no signs of slowing. 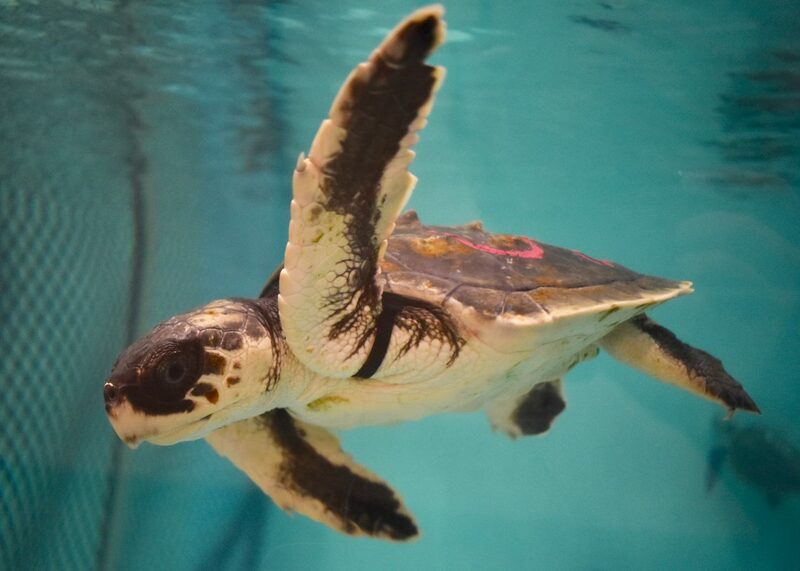 More than 320 sea turtles have arrived at our sea turtle hospital so far this year. 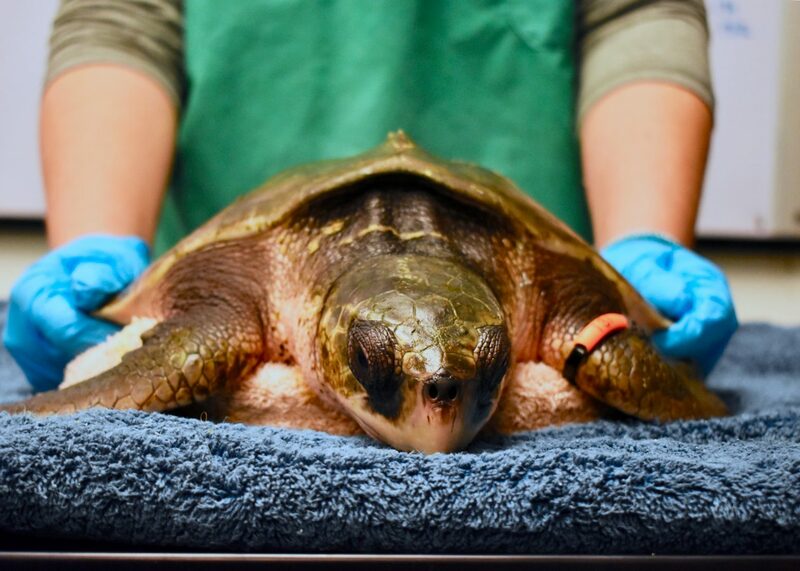 There’s a careful protocol for treating cold-stunned turtles that arrive from our rescue partners at Mass Audubon at Wellfleet Bay. Many of the turtles are hypothermic and must be slowly rewarmed. 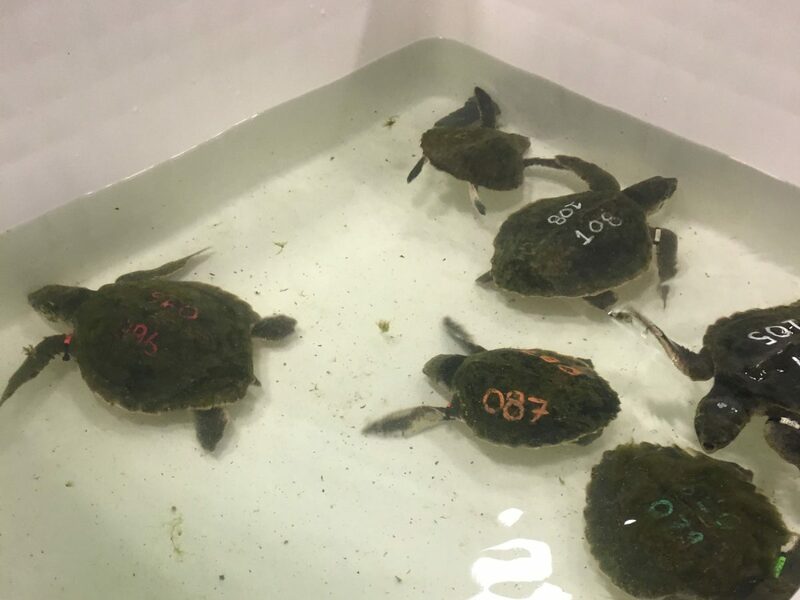 Once the turtles are stabilized, transport missions for the healthier turtles are coordinated to make room for more turtles arriving from Cape Cod beaches. Other turtles remain for months of careful treatment by our veterinary staff before the turtles can be released back into the ocean. So in the thick of rescue season, our dedicated team of staff and volunteers spends long days conducting intake exams for all the cold-stunned turtles arriving each day, continuing rewarming some of the more recent arrivals, and performing medical exams and continuing treatment and rehabilitation for all turtles that remain in house. That’s more than 100 turtles on any given day! Here’s a look at what keeps our team working long hours as they rehabilitate cold-stunned sea turtles and treat any underlying illnesses. Volunteers drive the turtles from the Outer Cape to our Quincy sea turtle hospital. On arrival, each turtle gets an initial exam to check for any external injuries. Then turtles are given supervised swims in shallow pools of increasing warmth. The turtles' temperatures are raised only 5 degrees per day. 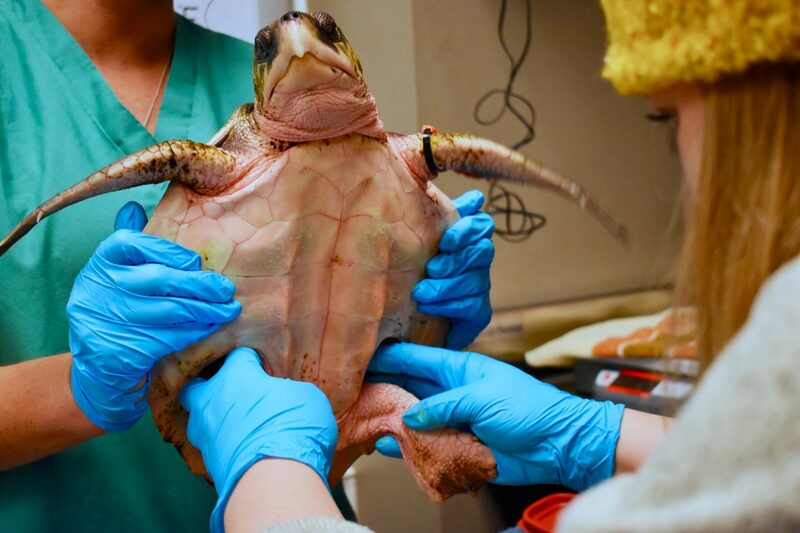 As their rehabilitation continues, the turtles get regular exams where each turtle is given a thorough exam, blood is drawn for testing, and fluids and medicine are administered. 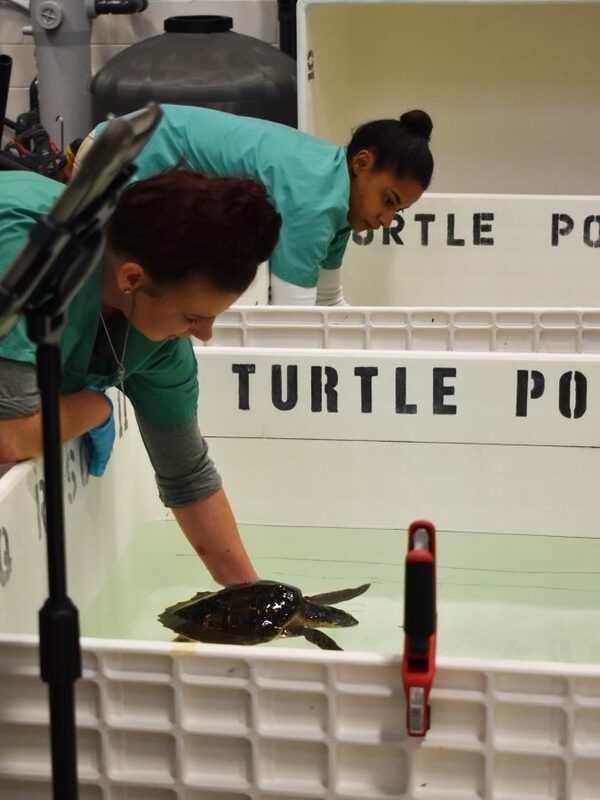 When their temperature is stabilized, the turtles graduate to a larger rehabilitation pool. The rehabilitation process can go on for months. 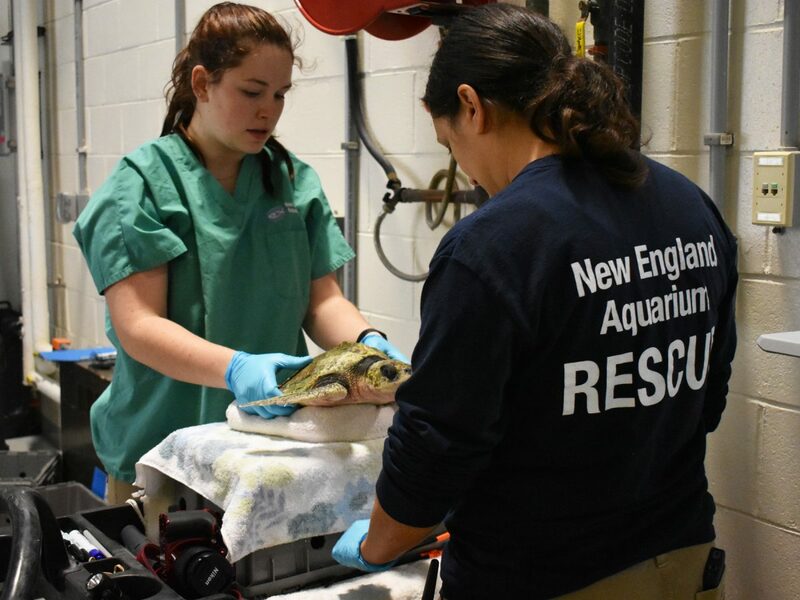 The New England Aquarium has been in partnership for more than 25 years with Mass Audubon’s Wellfleet Bay Wildlife Sanctuary rescuing, rehabilitating, and releasing thousands of endangered and threatened sea turtles.